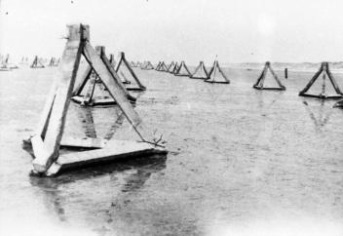 The Atlantikwall was made up of individual fortified positions, built a short distance apart, which could give each other fire support. The size of a position and how heavily it was armed, depended on the strategic significance and vulnerability, of its location. 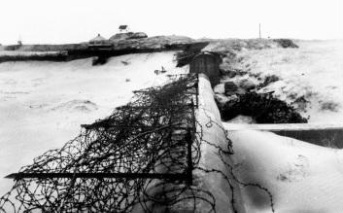 The Germans used the following terms for these positions (in order from small to large): Widerstandsnest (resistance nest), Stützpunkt (support point), Stützpunktgruppe (support point group), Verteidigungsbereich (defensive zone) and Festung (fortress). The Festung was the most important position, it needed to be defended to the last bullet and the last man. Only eleven of these Festungen were created along the entire Atlantikwall. The Netherlands was home to two Festungen: Hoek van Holland (Hook of Holland) and IJmuiden. The Germans considered the Festung of Hoek van Holland the most important stretch of the Atlantikwall in the Netherlands, because it could deny any invader access to the major port of Rotterdam. 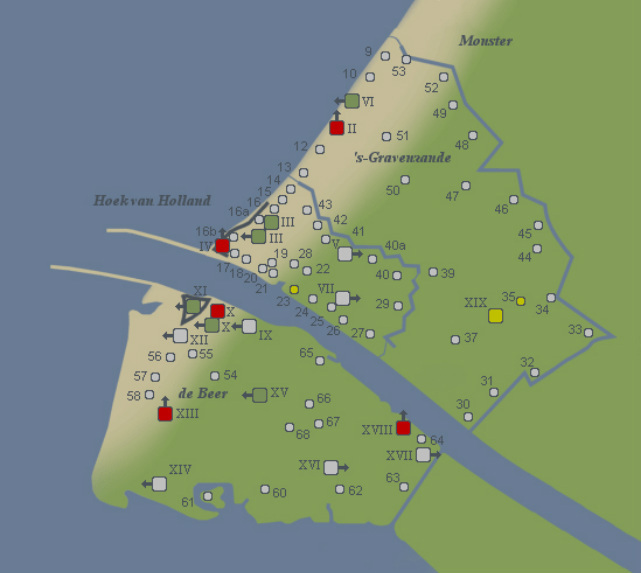 The map below shows the entirety of the Festung Hoek van Holland. The map indicates all fortified positions within the Festung. None of the buildings on island ‘De Beer’ remain today. After the war this extraordinary piece of the Atlantikwall was demolished to allow for expansion of the port of Rotterdam. On the northern side of the estuary many buildings have been preserved. The visitor centre of the museum is part of the former ‘Widerstandsnest 17’. The ‘Normole’ guided tour is conducted within the limits of anti-aircraft battery IV, ‘Nordmole’. Nordmole is the German word for ‘northern pier’. Click on the type of fortification in the legend next to the map to learn more.